The DS keeps providing shelter for all kind of miscreants: Angry Birds was recently announced for a DS release, and now Popcap's similarly world-dominating strategy title Plants vs. Zombies is getting ready to infect the console next year. Plants vs. Zombies is tower defence done differently: there are no towers, for a start. The trailer below makes more sense, though be warned: it contains a zombie bobsled team. Unlike many iPhone to DS conversions, Plants vs. Zombies is taking the retail route, arriving in stores in January 2011. for around $20. Considering the title costs around $2 in the App Store, it's hard to see this as a good deal for Nintendo owners: such a title would be perfect for DSiWare, so a 1,000% price increase for the DS version is hard to stomach, even with the promise of exclusive content. You know, I'd say Plants vs Zombies is worth $20 as a retail release for the DS. I'd expect some new content, of course. Yay! I was worried it would be DSiWare. this game is popcap's very best. awesome news. I'm dissapointed that this isn't dsiware, I would've bought it if it was. Ptobalby would skip this game anyways...then again this one is portable...but yeah, they better add some new stuff here. The iPhone version is just massively underpriced, the PC one costs more. As KDR said, on PC it's $20 so I see no problem with taking the game with me on my DS. Was about to buy the Collector's Edition but now I'll just wait a couple of months. Finally, this was announced like back in 09...looking forward to getting this on my DS! P.S. Angry Bird is cool, looking forward to buying that once it comes out for Pre this week. If the pc version costs the same than maybe it is big enough to warrant a retail purchase. A little too late for me since the XBLA version will be coming out on September 28th and it will cost $15. If they were developing this game for the 3DS then I would actually be willing to hold off on my XBLA purchase. These DS ports are starting to look really dated now. I'm looking at you Puzzle Quest 2. I got the pc version but would probably play it more if it was on the DS. Ive heard good things about this game so ill keep eye out for it when its in stores. Beat this a few times on the pc and almost completed it now. DS wont add much but I will probably get it anyway as I love this game so portability is attractive. 3DS will be backwards compatible anyway right? PvZ is awesome, but just like Chinatown Wars, it's a much better deal on the iPhone. @Joe, Yes it is backwards compatible. I'll have to get this when it comes out. PvsZ launched at $20 for PC, the iPhone version wasn't the full game, and the DS release promises more content. So the price point is perfect. 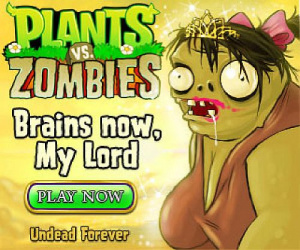 Plants vs. Zombies is absolutely worth $20. It can be a little upsetting to find it priced elsewhere cheaper, but in no way does that suggest that the $20 price tag is higher than the game's value. Also, I imagine the touch screen control will work wonderfully for this game. Pick it up! i love this game. I will probably get it! I already have the iTouch version, so I don't think I'll be buying this unless there's some very good exclusive content. It's only worth $20 if you don't already own it. (but people without iPhone/iTouch, it's worth it). Might have to get this. Loved the PC version. Popcap haven't released the ds versions of peggle dual shot, bookworm and bejeweled twist in the EU yet and there's NO NEWS of them planning to. We don't even have the dsiware versions of the latter two. I have imported peggel dual shot and bookworm as I found them for reasonable prices on e bay, but this isn't fair really. Bought it a couple days ago. The new game content is pretty nice. New plants also. GREAT game, buy it! Don't get DSiWare Version, it will only contain the adventure mode, nothing else. Worth 20 dollars.